Incredible call-out ceremonies happen here! After Twilight programs end on Monday evening, the OA lodge hosts a cracker barrel for all OA members in the OA Lodge Building. The cracker barrel begins at 10:00 pm. Scouts will be out of campsites after taps. All OA members, even those from other lodges are invited to participate. During the Monday night cracker barrel the lodge officers and youth OA members in camp will plan the Thursday night Call-out ceremony. The lodge conducts a Brotherhood ceremony on Tuesday night. Those OA members who are eligible to convert to Brotherhood are encouraged to take advantage of this opportunity. Our Brotherhood Conversion Guide reviews the requirements and provides support. The Brotherhood ceremony begins as Twilight activities close (around 8:45 pm). The Brotherhood conferences take place during lunch on Tuesdays at the Dining Hall Shelter. All Brotherhood and Vigil members are invited to observe the Brotherhood ceremony. Youth Brotherhood and Vigil members, regardless of lodge membership, are invited to serve as torch barriers for the ceremony. Unfortunately, due to national OA policies, we are not able to conduct Brotherhood conversion for OA members not in our lodge; however, Brotherhood & Vigil members from other lodges are invited to participate in the ceremony. The Call-out ceremony is part of the campfire during Thursday’s Family Night. OA youth members, even those from other lodges, are invited to participate in the ceremony. OA youth members can volunteer to participate in the ceremony during the Monday night cracker barrel. We practice the call-out ceremony after lunch on Tuesday, Wednesday, and Thursday. If the proper paperwork is completed, we are able to call-out OA candidates from other lodges. The OA summer camp representative will review the Call-out ceremony procedures with adult leaders during the Thursday leaders meeting. 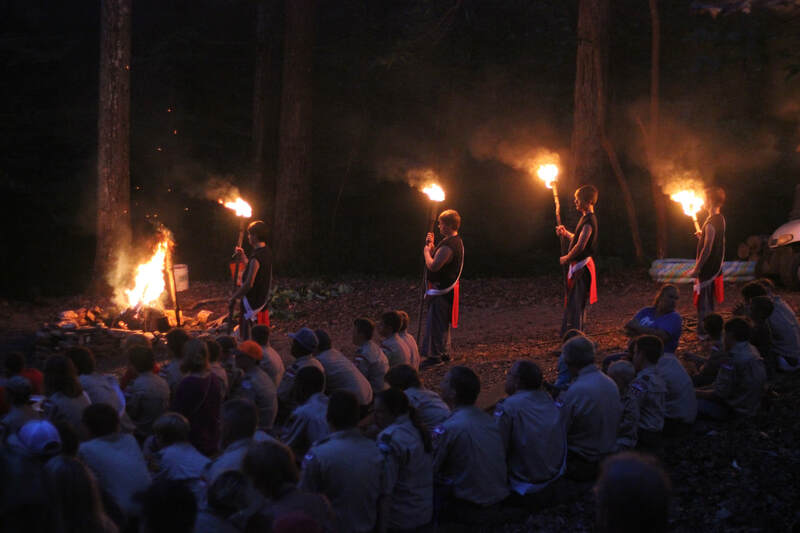 The lodge hosts an informational meeting for newly called-out Scouts and their families after the Thursday night campfire. ​Remember to bring your OA sash to camp!